SOGIP (Scales of Governance, the UN, States and Indigenous Peoples: Self-Determination in the Age of Globalization) is a global, multi-scale, comparative research project investigating the social, cultural and political issues relating to governance and the rights of Indigenous Peoples. The project is founded on an original research framework designed to capture the complex relationships between the global and the local in an analysis of the discourses, politics and practices of actors of unequal power. The adoption by the General Assembly in September 2007 of the United Nations Declaration on the Rights of Indigenous Peoples (UNDRIP) opens a new horizon for reflection on the possible modalities of the right of all peoples to self-determination. 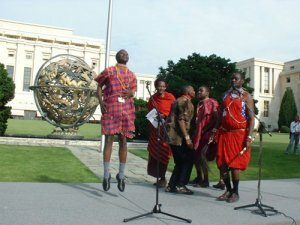 While the mechanisms for constitutional, legal and political recognition remain largely defined by nation states, the appeal of Indigenous Peoples to the international community in the second half of the 20th century and the current transcontinental mobilizations of Indigenous Peoples have led to increasing global awareness and recognition. The adoption of UNDRIP represents the culmination of this global movement, and gives rise to challenging research opportunities. With its high moral and symbolic value, UNDRIP generates expectations for political changes within states to address the marginality of indigenous populations and promote self-determination. Exactly how this will happen, however, is not sufficiently understood. SOGIP has initiated ground-breaking comparative research on UNDRIP’s impacts, with the aim of producing significant results by the end of the Second International Decade of the World’s Indigenous People in 2015. The research of the SOGIP team simultaneously addresses the changes that international norms produce via the development of international programs and the responses of States and Indigenous Peoples at the local level. Our research focuses on certain arenas in which indigenous perspectives and public policies come into confrontation: education, land management, political representation, legal systems and the expression of culture. We are undertaking studies in Southern Africa, South America, Asia and Oceania. Our work also aims to create a dialogue between the different debates being articulated in the Anglophone, Francophone and Hispanophone worlds on post-colonial situations and indigenous rights in the era of globalization. SOGIP’s comparative approach, along with our collaborations with indigenous partners and certain international organizations, is designed to take us beyond the simple dichotomies that limit how indigenous issues are conceived and addressed.